This has come out of left field. I’ve fiddled about with writing for some time and Scrivener is a great tool for that non-linear approach to putting a complex written project together. Having seen a discussion of the National Novel Writing Month on TV this morning I saw this as inspiration to get one of my ideas kick-started. Let’s see how I do at writing a novel from scratch in a month – from 00:01 on the 1st of November to 23:59 on the 30th. 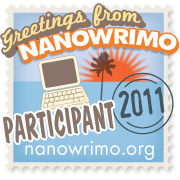 Clicking on the stamp will take you to my page on the NaNoWriMo site. A 50,000 word novel in 30 days. That’s OK. About 6 pages a day, start to finish.